85% of buyers were using non-BI software to handle their business intelligence needs. Over 50% of buyers preferred a web-based system with dashboard and data visualization components. 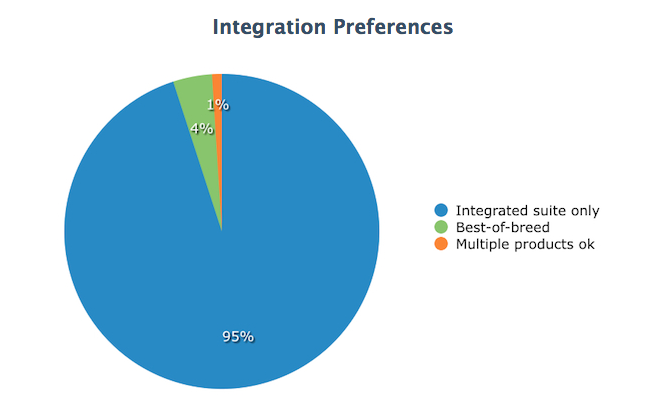 70% of buyers wanted a system with dashboard reporting capabilities: 46% wanted a solution that generates KPI overviews. Seems like businesses are ready to say goodbye to the spreadsheets and their never-ending rows of data! Seventy percent of buyers who were evaluating BI solutions with dashboards or other data visualizations are first and foremost aiming to improve their organization’s reporting methods. Meaning, the the most desired BI capability today is to create graphical representations of company data in a dashboard and report format. 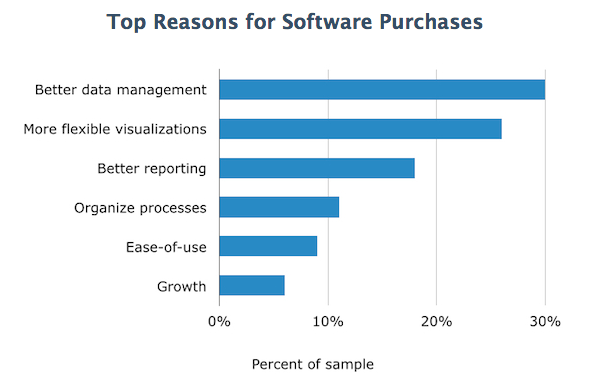 The top reasons for actual software purchases also highlights the need for reporting apps as 18 percent of buyers said they were searching for better reporting functions, and around 10 percent said they wanted to streamline processes within their business, and use a system with greater “ease-of-use”. While reporting is the number one most-desired functionality, 46 percent of buyers are looking for a BI solution that can generate a clear, easy-to-understand overview of a company’s KPIs. 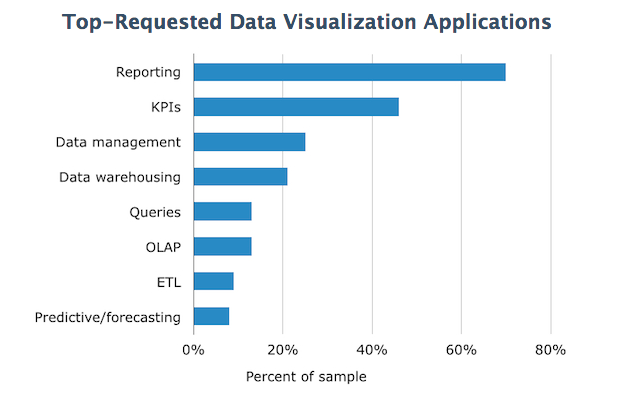 The third most sought-after functionality is the ability to drill down and slice and dice data using data visualization functions–which focuses more on powerful data management capabilities in back-end, rather than front-end reporting and data visualization tools. Meanwhile, 21 percent of buyers specifically mentioned they were seeking a data warehousing application, while 13 percent wanted a query tool to assist with managing data. What was the reason behind actual BI purchases? Thirty percent of the buyers were trying more effective methods for managing the data their business or company had compiled. Another 26 percent of buyers said they were dissatisfied with the BI system they currently had—most often an ERP, CRM or other BI system—and sought out a solution with more flexible visualizations. Though research of the overall BI market revealed that the majority of buyers were not IT professionals, honing in on buyers who are responsible for evaluating BI products showed that IT professionals were in fact calling the shots. Forty-six percent of buyers identified as IT-related–such as IT managers, IT consultants and directors, as well as BI managers or BI analysts. Coming in at 20 percent, the second-largest group of buyers, were non-IT managerial roles such as operations manager. Only 9 percent of buyers were C-suite executives. Manufacturing and healthcare industries were the most represented among prospective buyers, with each group making up 10 percent. Many attribute their presence to the large Excel spreadsheets that causes data preparation nightmares in internal supply chain management systems as well as healthcare companies Banking and financial industry came in at 8%, while the software industry and government entities made up 7 % of the sample. Most buyers today are coming from larger businesses as 36 percent of buyers were from organizations with between 101 and 500 employees, and 26 percent were from organizations with over 1,000 employees. The annual revenue of $6-25 million made up 20 percent of the sample—the largest single group. Sisense provides a single business intelligence software that has an integrated suite of all the tools you need to access, join, and analyze multiple data sources of any size–all with minimal IT involvement. With Sisense, business users can build and understand reports quickly and easily, using data visualization and reporting tools, mobile access, and sharing capabilities. Based on the research of Software Advice, second to reporting the most sought-after functionality is the ability to drill down and slice and dice data using data visualization functions. This is an important differentiation between reporting functions, since buyers specified that they were more interested in accessing and digging into their data on the back-end. Sisense provides both a powerful back-end technology, which is the underlying technology that gives users the ability to easily manage and investigate their data, as well as a front-end, the data visualization tools. Our unique and award-winning technology allows non-technical business users to access more data faster and easier than any other BI tool on the market. Read the full report from Software Advice here.